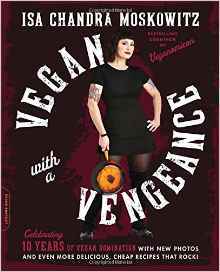 It was only a month ago or so when I was thinking that my favorite cookbook ever is Vegan with a Vengeance by Isa Chandra Moskowitz. I had the pleasure of meeting her at the vegan blogger conference a few years ago. And just recently, her publisher informed me that the book is now 10 years old and they republished a 10th anniversary edition with new recipes and pictures. So, I just had to get my hands on it! This book is beautiful as compared to the one 10 years ago. She updated it with glossy colorful pages and beautiful pictures of most recipes. She also updated the instructions to simplify them and streamlined the ingredient lists for all recipes. She even added a few new recipes. I gave a few of them a try. To start, I made the rich and creamy Seitan-Portobello Stroganoff, which knocked my socks off! 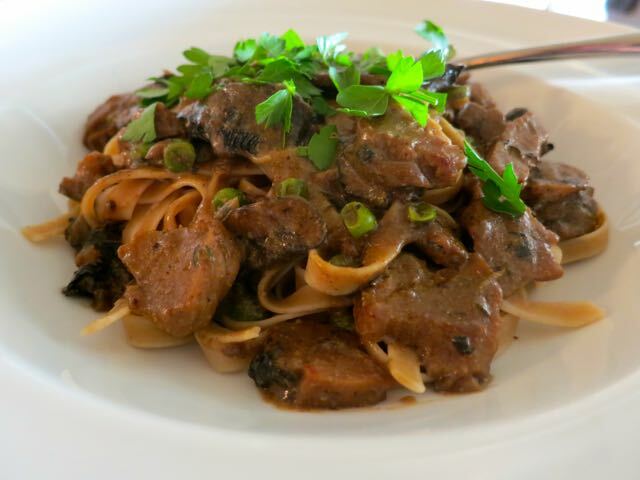 Thick meaty portobello and cremini mushrooms along with hearty seitan in a savory sauce over fettucini, topped with fresh parsley is mmm mmm good. 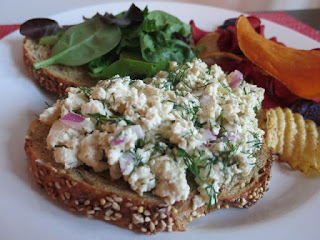 Next up, the Tofu-Dill Salad Sammiches . In just a few minutes, you are whipping up a tofu-based egg-salad-like salad filling that is satisfying and tasty. I will say that with such a light taste, I felt it needed a little more oomph so I put Dijon mustard on both sides of my bread before topping with the tofu-dill mixture and that made all the difference. Serve these for lunch with chips and/or a pickle. 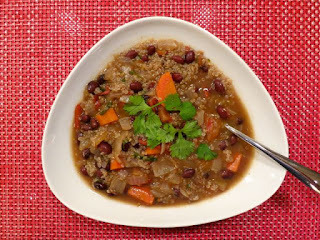 Lastly, I tried a simple, yet satisfying recipe -- Black Bean and Quinoa Soup. This hearty soup filled with onions, carrots, black beans, and quinoa is a meal unto itself and once topped with avocado and cilantro, it'll be sure to please. Other fantastic recipes include my classic favorites of Scrambled Tofu and Fronch Toast as well as Potato Samosas with Coconut-Mint Chutney, Garlicky Kale with Tahini Dressing, and Peanut Butter Oatmeal Cookies. As a classic, this book really is a must-have. I can asssure you that you will not be disappointed with the quality of these recipes. She is one of the innovators of vegan recipes and I promise you'll find something you didn't know buried in this book. For just $15, you can get your own copy on Amazon here . Bon appetit!